Noel Fielding is currently inside his first solo tour for five years. 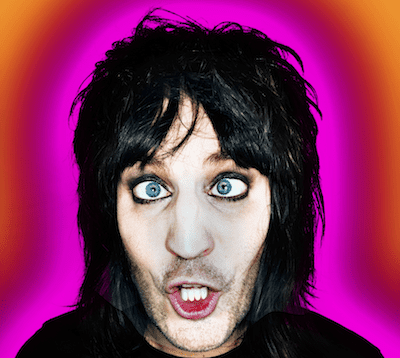 The comedian, who thanks to his work on The Mighty Boosh, Noel Fielding’s Luxury Comedy and Never Mind The Buzzcocks, has an enormously loyal following, is starring in a new show, simply entitled, An Evening with Noel Fielding. Noel and I are chatting in his north London studio. Surrounded by props – including life-size cardboard cut-outs of a robber with a stripy jumper and a swag bag and a nun wielding a huge gun – and his own arresting paintings, he makes for marvellously entertaining company. It is a delight to spend an hour in the company of this hilarious and magnetic comedian. The five years away from the live arena have only whetted Noel’s appetite for stand-up. He can’t wait to get back in front of an audience. The performer, who has spent the last few years occupied by the meticulously produced, semi-animated E4 show, Noel Fielding’s Luxury Comedy, begins by underlining that nothing beats the rush generated by live work. “The problem with TV is that it takes years to make, and after a while you can’t remember what it’s like to tell a joke and get a laugh from it. Because it’s so deeply original and innovative, Noel’s comedy can divide people. But he thinks that the infectious nature of his stand-up show can help to win over the agnostics. “Some people might think they’re allergic to you, but if they come to a live show and see everyone is laughing, it’s hard to say that it’s not funny. It was the same with the Boosh. Sceptics were convinced when they came to our shows. Noel’s comedy is always richly imaginative, but can he tell if he’s gone too far? “No!” laughs the comedian, who has also acted in The IT Crowd, Nathan Barley and Garth Marenghi’s Darkplace. “Locked away in North London for years making Noel Fielding’s Luxury Comedy, we’d think, ‘Let’s do something based on William Blake’s painting, The Ghost of a Flea.’ That could be very self-indulgent. Noel, who is hopeful that he and Julian will one day find the time to make a long-planned movie, continues that, “There are certain things that you just know will work. At one point, I play a herbal tea bag. I knew that would strike a chord because everyone has tea. The only drawback about touring as far as Noel is concerned is that, “You’re buzzing with adrenaline when you come off stage. You have to do something with that, and it’s very hard not to go and get drunk. In the old days, we’d give the Rolling Stones a run for their money with our after-show behaviour.